After working in the motor industry for all those years, it’s not always easy to find the enthusiasm that I once had to drive the latest (insert manufacturer here)’s hatchback, saloon, SUV, crossover etc. 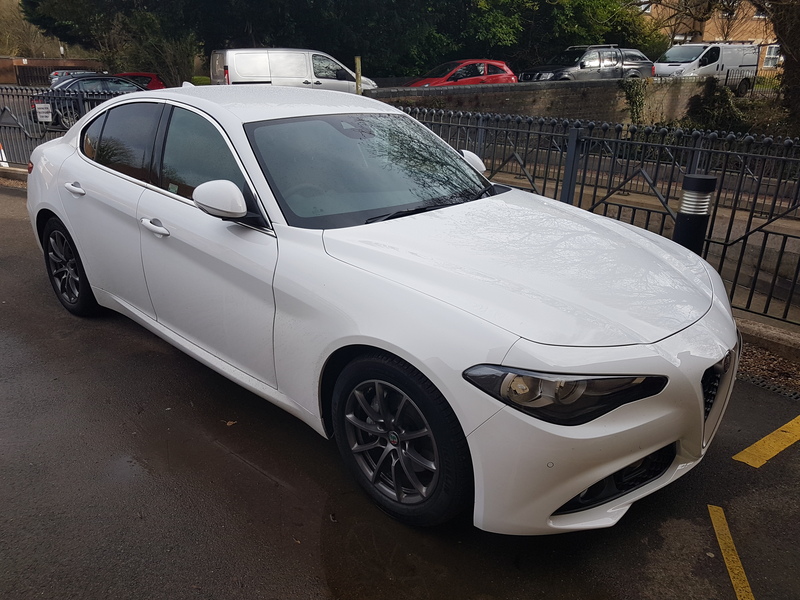 At a conservative estimate, I’ve driven more than 1500 cars, so I was surprised to find that I was genuinely excited when Alfa Romeo confirmed the 2 week demonstration of the Giulia. The demo period coincided with a trip down to London, so I took the opportunity to put it through its paces on a busy motorway commute, combined with a blast* through the countryside of Worcestershire and Warwickshire. The brand have been absent from the Premium Upper Medium space since the 159 was discontinued in 2011, and since then the sector has been dominated by the Germans. Against such stiff competition, this was a car that Alfa Romeo had to get right, and first impressions are, after 4 days and 400 miles, they have. Full colour sat nav, voice controlled media, DAB, Bluetooth, dual zone climate control, leather faced seats (if you want full leather, you’ll have to spring £2750 for the Lusso pack, which gives leather everything, heated wheel, chrome and a number of exterior styling tweaks). But it’s on the road where this Alfa really shines; with the power going through the rear wheels, as it should, this is the only car in its class guaranteed to put a smile on your face during the daily commute. The entire range is equipped with the DNA drive mode system, which provides an instantaneous, on-the-fly switch of modes to suit the driver style and road conditions. In Dynamic mode, the brake, throttle and steering response is dialled up, Natural is for daily driving, and Advanced Efficiency is for maximum energy saving. I found the latter setting too restrictive, but it did deliver some real fuel economy benefits on the motorway. The Auto box, engineered by ZF, is the only transmission currently available, although £250 will equip you with column mounted paddles, if you like that kind of thing. The exterior styling manages to be both familiar and understated, and once the famous trilobo is viewed from the front, distinctive and beautiful. As this car shares components, electrical systems and transmissions with other makes and models, it shouldn’t, in my humble opinion, be any more or less reliable than anything else. It’s reasonably well built, although it isn’t quite as solid feeling as the Audi. Also, under full lock, the front wheels judder and skip, particularly in the wet. I’m sure that this will be described as a “characteristic”. On balance then, would I swap my current generation A4 for this Guilia? Yes. Without doubt. It’s more exciting and aesthetically pleasing, dynamically better, with a faster and better media system than the A4 (the A4 suffers from chronic lag on voice commands, but that may be because it doesn’t speak Brummie). The Guilia is the perfect company car, the antidote to dependable, abundant (common?) rivals, and if you still have reservations about the R word **, then the 36 month unlimited mileage warranty and breakdown assistance should go some way to assuage you. * Adhering to speed limits at all times.